Yep, it’s a classic. It might not be as versatile as the movies claim, but it is a good stand-by. Of course, this one brand offers dozens of varieties. The No-Drip Streak-Free Foaming Action Windex is a good choice. The original with Ammonia-D is also great for window cleaning. This product is good both indoors and out. It’s not too pricey. It’s a simple solution to remove tough grime. You have a whole house of windows to clean, and you wonder if it’s worth saving a buck or two by purchasing the store brand window cleaner. While Windex has a pretty strong reputation, store brands will often do just fine. The main difference you might encounter is outdoor muck. The interiors of your windows will probably clean fairly easily, but some off-brands might not have the kick you need for the exterior. But, adding a little elbow grease often does the trick. Since your cleaner won’t have the traditional blue coloring, be sure to label your bottle. You don’t want to mix it with your houseplant mister! Are you hoping to keep your window cleaning project as environmentally-friendly as possible? Many manufacturers are now producing green alternatives. Seventh Generation Free and Clear Glass and Surface Cleaner is a good option. This brand’s cleaners are made from natural sources. It might not be as strong or effective as other brands, but meets your needs if your goal is green. It’s also not much more expensive than other, traditional cleaners. Would you prefer to shine your panes with a more pleasant aroma? Companies now offer solutions that smell less like cleaning supplies and more like bouquets. 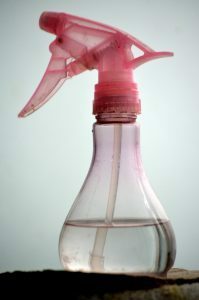 Mrs. Meyers offers a glass cleaner that is known for effective results and great scents. The product is made sans ammonia, with other fragrances added, to create a more desirable smell for your window cleaning experience. One brand is available that requires no spraying, scrubbing or sweating on your part. Central Window Cleaning. These trusted professionals are available to restore your windows’ brilliance, without your lifting a finger. Let your panes be our problem. Contact Central Window Cleaning today to receive a free estimate for window cleaning in Cleveland, OH.